Mosel River is popular with the many castles that line up, like beads along both sides of the river. The Mosel is a river that runs through France, Germany and Luxembourg, over 545 km long. For Frenchmen Mosel is known as the Moselle, and for the residents of Luxembourg, the river carries the name Muse. River Mosel is renowned for its picturesque “valley of the Mosel”, which is synonymous with fertility, beauty , hills covered with vineyards, castles and many, many beautiful sights and places. Mosel is a name which comes from Latin and literally means "little mouse". Mosel rises from the western slope of the hill Ballon d'Alsace in the Vosges mountains. The river starts in the west to the region Lorraine. Further valley Mosel is bordered by the beautiful landmark mountains Eifel and Hunsrück. Mosel is a major tributary of the Rhine, as a part of the Mosel flows into the larger river at Koblenz, the site being known as Deutsches Eck. At the break of Mosel in Koblenz is located the fortress Ehrenbreitstein Castle, which is one the best places where you can enjoy the perfect view of the German countryside. On the German side was built a statue of Emperor Wilhelm I, which was erected in this place in 1897, nine years after the death of the German head. This monument was officially opened on September 25, 1993. It reaches a height of 37 meters, just the emperor has a height of 14 meters. 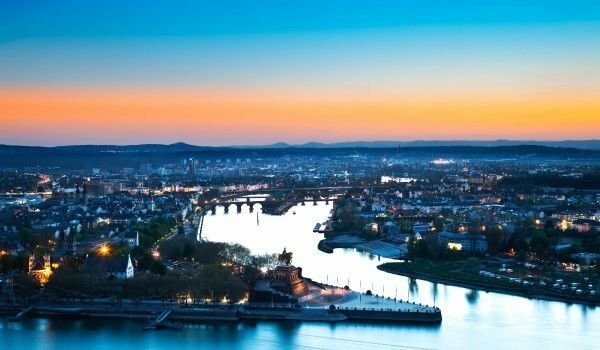 The German side of the confluence of the Mosel and Rhine in Koblenz was declared a monument of world heritage by UNESCO. Mosel goes through quite a few beautiful German cities , among which is the Trier - the oldest city in Germany. It stands on the west bank of the river in the German Land of Rhineland-Palatinate. Very close to Trier is Germany's border with Luxembourg. The city is renowned for the best preserved Roman city gate, north of the Alps, which is known as Porta Nigra. Also remarkable is the cathedral of Trier, which is considered to be the oldest Catholic church in Germany, which is also part of the cultural heritage list of UNESCO. Viticulture and wineries near Mosel have millennial traditions. Near Trier on the river Mosel is the oldest wine village - Neumagen, where you can see the oldest wine vessel, and the oldest mill, north of the Alps. Intriguing fact is that in this land over the Mosel lies the steepest vineyard in the world: Bremmer Calmont. It’s inclination of 65 degrees is one of the highlights in the Mosel-Saar-Ruwer, which is the largest wine producer in the world. The total area of vineyards here amounts to 9086 hectares. The fertile hills of the valley Mosel have an annual production of 850, 000 hectoliters of wine , of which 70, 000 are red. From Mosel Riesling comes a great grape variety and wine growers in the valley are approximately 5258.